GREEN TULLE SKIRT, GREEN WEDDING, GREEN BRIDESMAID SKIRT, SAGE Tulle Skirt, SAGE GREEN, MINT GREEN, LIGHT GREEN, DARK GREEN, MAXI TULLE SKIRT, WOMEN FULL TULLE SKIRT, BOW BACK Tulle Skirt, Plus size Tulle Skirts, Tulle Maxi Skirt, Wedding Tulle Skirts, Custom available, don't miss it! This maxi dress is made from 2 layers top quality Tulle and one piece of imitating soft satin lining. 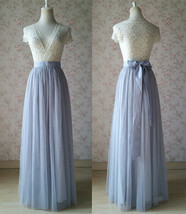 This tulle skirt is special fitting as wedding bridesmaid outift. If you need to custom made for your girls, please let us know and we would make a perfect plan for your bridesmaids. Unique Back Bow-knot ribbon design, which is also best choice for wedding shoot. The bowknot is unmovable. We offer many waist band options, including bowknot as picture, flat waist band, elastic waist band. Please tell us your request, and the default choice just picture design. * Length: We offer several length options. If you need custom made, please let us know firstly. Fixed waist band with Back Bow as picture showed, which is unmovable. * Measurement: Please check the size chart. If you need assistance, kindly let us know. * Occasions: Wedding Party, Birthday Party, Family photography and more other celebrity events. * Processing time: around 7 -10 business days. For any speical timeline, please let us know firstly. All the items are shipped out by EUB's air mail with a registered tracking number. It usually take 10 days to arrive. Occasionally it may take longer around 20 days, But in most of cases, it's prompt and safe. We also offer express shipping service through EMS / DHL / FedEx. Shipping time is around 3-6 business days with in-depth item tracking number.